A letter from James Milton Thomas to Gary I. Sharp, dated November 10, 1975. 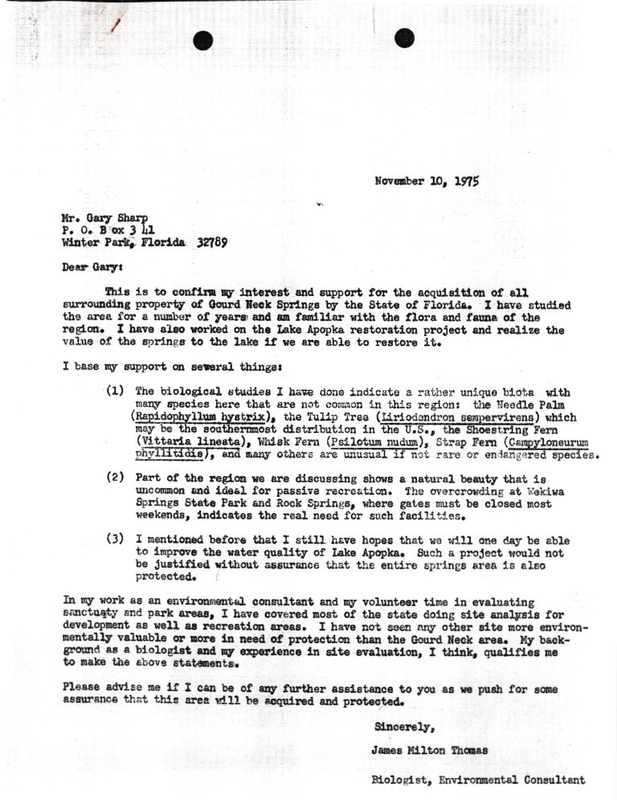 In this letter, Thomas, an environmental consultant, writes to in support of Sharp's proposal that the State of Florida acquire the Gourd Neck Springs area for use as a public park. Thomas briefly describes various plant species that he has identified in his surveys of the area, including rare species like the Tulip Tree and the Needle Palm. Thomas also states that the area has both environmental and recreational value, and a park in the area may help alleviate overcrowding at other parks like Wekiwa Springs State Park. Thomas later served as the first president of the Friends of Lake Apopka (FOLA) after its formation in 1991, working as an advocate for restoration of the lake. Photocopy of original 1-page typewritten letter from James Milton Thomas to Gary I. Sharp, November 10, 1975: binder 1975, Friends of Lake Apopka Archives, Ginn Museum, Oakland Nature Preserve, Oakland, Florida. Digital reproduction of photocopied 1-page typewritten letter from James Milton Thomas to Gary I. Sharp, November 10, 1975. Originally created by James Milton Thomas. Thomas, James Milton. “Letter from James Milton Thomas to Gary I. 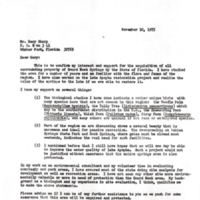 Sharp (November 10, 1975).” RICHES of Central Florida accessed April 20, 2019, https://richesmi.cah.ucf.edu/omeka/items/show/7834.